Dozens of Syrians were killed in a suspected chemical attack on a rebel-held area on Tuesday, prompting a fierce denial from the Syrian government despite accusations from activists who labeled a government airstrike as the culprit. 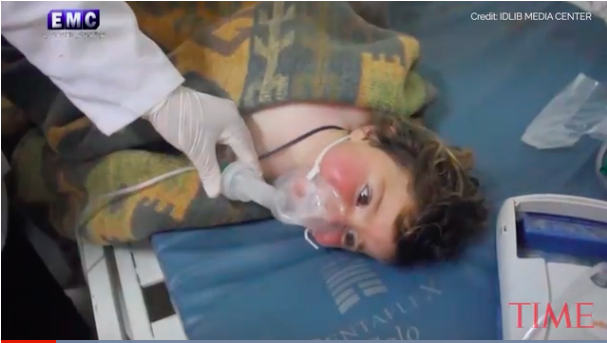 Horrific images and footage emerged after the attack in Khan Sheikhoun, in north Idlib province, showing the dead on the ground, their limbs spread outward. At least 58 were dead, with dozens more injured, according to the Associated Press. Others who survived, including young children, were fitted with oxygen masks in hospitals to assist their breathing. As the death toll climbed, it drew comparisons to the August 2013 chemical attack outside Damascus that left more than 1,000 people dead. Two photographers with Agence France-Presse detailed their experiences in hospitals that received several of the victims. Omar Haj Kadour wrote that he was nearly 50 miles away when he heard about the attack. When he arrived to the town’s main hospital, he saw a father hovering over his young daughter as a medical worker tried and failed to provide aid. Outside, he found bodies that were wrapped in blankets in the parking lot. This article originally appeared in Time by Andrew Katz.